A typical day for the office crew at Baranof starts late the night before. 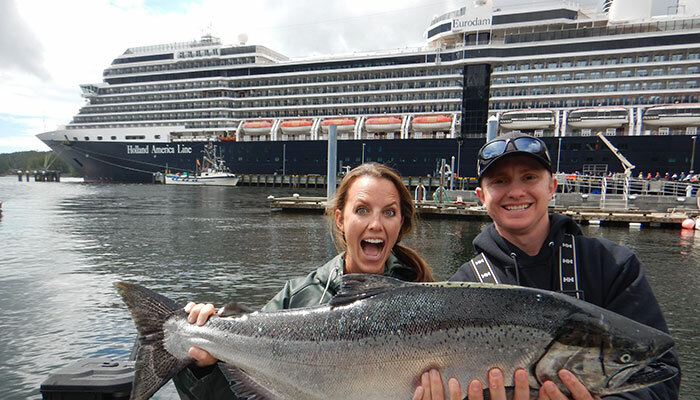 We allocate a certain number of seats for salmon, halibut, and our culinary fishing excursions to each cruise ship that will call in Ketchikan on a given day. Based off how many cruise ships will be visiting, the size of the ships, time of year, our relationship with each ship’s sales staff and their previous sales, and a magic 8-ball, we determine an expected number of guests from each. While the number for a specific ship is rarely exactly what we predict, when taken as an average we are very close at predicting a passenger load for each day. Typically, however, we don’t receive those numbers until the end of preceding workday, which is when Bonnie starts working her magic. Organizing our 20 odd boats, with 4-6 passengers on each, over three unique Ketchikan fishing excursions (let alone the customized private charters), while keeping family’s and parties together is an impressive feat accomplished by Bonnie and her crew. Once the plan for the next day is set, they’re ready to hit the ground running in the morning as soon as the cruise ships hit the pier. Most industries have a lot going on behind the scenes to get a product to the client, and tourism is no different. While there are the standard support teams such as accounting and HR, businesses like Baranof Fishing Excursions deal with a unique set of concerns. It takes a special kind of person to run the shoreside end of an operation such as ours. Good office managers for Ketchikan fishing companies require logistical skills, good situational awareness, calm under pressure, and the ability to work five months on a truncated sleep schedule. Bonnie Steinberg is our gal. Defined by her ability to stay focused and not lose her cool amidst the chaos, she exhibits the same control and care you might remember from your preschool teacher. Baranof is proud to have her, so we’d like to give you an idea of what her summers look like on a day to day basis.